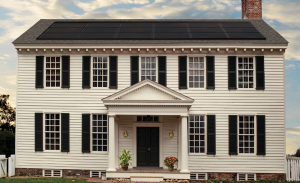 GAF is determined to compete in the solar roofing market. Is the future of roofing solar? That’s certainly what Tesla Motors boss Elon Musk bet on when his outfit bought Solar City and introduced its solar roof offering. But Tesla isn’t the only company with solar roofing plans. Other companies, including roofing manufacturer GAF, clearly see opportunity when it comes to solar roofing. Last year, Tesla bought Solar City for $2 billion. Later, Musk introduced the Tesla solar roof, which consists of photovoltaic, tempered-glass roofing tiles. The idea is that a property owner could install the solar roof and combine it with Tesla’s power wall battery to supply sun-generated electricity at any time. So far, Tesla has been slow to exploit any synergies. No Tesla stores feature the solar panels or roof, including its flagship store in San Francisco. And while Musk and some Tesla employees have the solar roof, made of textured glass, on their homes, there’s no indication that consumers have installed any yet. Last month, Chief Technology Officer JB Straubel confirmed that the company has begun producing solar cells at the Tesla factory in Buffalo, New York, and plans to begin producing the solar roofs there by the end of this year. Meanwhile, other companies from startups to industrial behemoths are charging into the solar fray. For GAF, the rooftop solar boom represented a possible market disruption for the old-fashioned roofing business, but one that could be additive rather than destructive. GAF redoubled its efforts starting around 2008, and after several rounds of refinement, launched the DecoTech product in January. Installations started in April. David Bange Roofing maintains relationships with top manufacturers including GAF, and has expanded its offerings to include solar roofing through RISE (Roof Integrated Solar Energy). The reason is solar’s growing mass market appeal, Tony Ruffine, GAF’s vice president for sustainability and strategic marketing, said in a telephone interview. A Bozeman, Montana, startup, Solar Roof Systems of Montana, is also getting in on the act. The company this summer teamed with New York manufacturer SunTegra to install solar roofs in the Gallatin Valley of the Big Sky state. Solar Roof Systems of Montana cofounders Anthony Sciolino and Jeremy Warwood tout the curb appeal and resale value of their product, along with its capacity for producing energy. But there are serious issues including price to consider before abandoning traditional roofing solutions such as tile, asphalt shingles and metal. Whatever suits your roofing needs, Lifetime Roofing offers unbeatable price for options from shingle to tile, metal and solar.